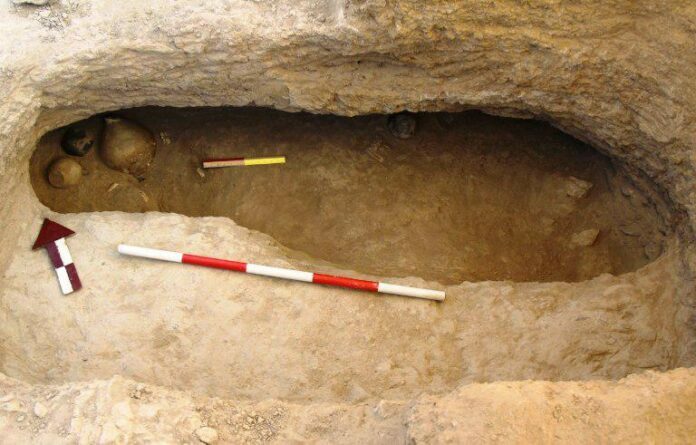 Archaeological excavations in a village in Isfahan province have led to the discovery of 12 graves, and remnants of the Bronze to Iron ages, grey pottery, and stone and agate beads. One of the excavation supervisors said the third stage of the explorations at Josheqan-e Estark village in the central District of Kashan is being carried out in the presence of international university professors from the University of Warsaw, the University of Adelaide, and 10 students from the US, Italy and Iran. This Iranian expert underpinned that the discovered pottery has not been extracted from the manipulated graves. This archaeologist said that the discovered items are graves, grey pottery, seals, beads made of stone and agate, and metal objects including spears, bracelets, earrings, and bronze pins. Javari referred to the study of human and animal remnants and the classification of bones as a feature of this stage of exploration. “Soon after the completion of excavations, with the presence of the explorers, the achievements of the third stage of the site’s exploration will be presented at a special meeting at the institute,” added Javari. Javad Hosseinzadeh, another supervisor of the team, said that by carrying out experiments and genetic studies in the cemetery’s ground, cultural affiliations with Greater Khorasan and Turkmen samples were observed. The researcher highlighted the DNA studies conducted at this ancient site and referred to the existence of ancient relics that are similar to those in the north-eastern part of Iran. He also expressed hope that by comparative and genetic studies, a new approach to archaeological studies of the late Bronze and Iron Age of Iran could be found.